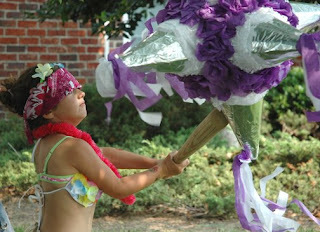 Last weekend we had a very fun Luau party for the kids birthday's. Jordan will be turning 8 in a couple of weeks and Briana turned 6 last week. When the kids woke up Jamie and I had the whole place decorated with streamers, balloons and all kinds of Hawaiian decor. They immediately went into party mode! :) We spent the majority of the day outside grilling some yummy Jerk Chicken, hitting a pinata, playing games and running around in the sprinklers! 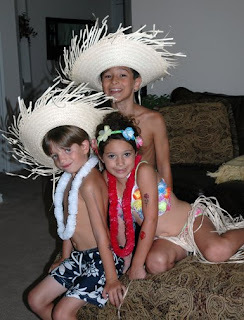 Jamie bought a cute little grass skirt and flowered top and headband for Bri and some straw hats for the boys. 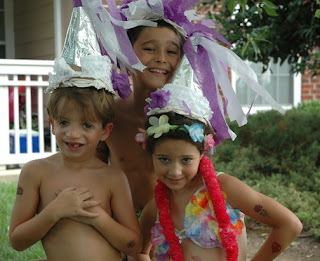 Here are the three cousins getting ready to party! 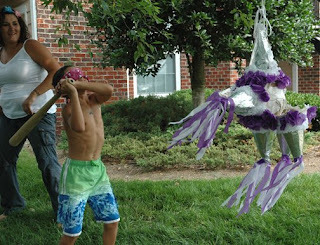 Here's some pics of the kids hitting the pinata. Here they are going after all the goods! 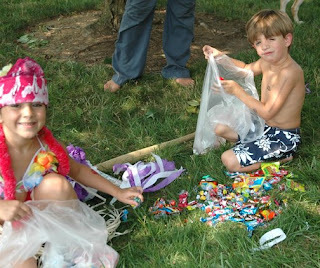 And posing with pieces of the pinata as hats! 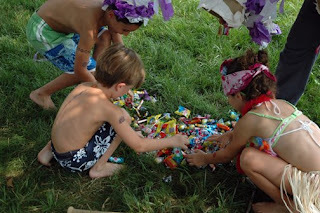 It was such a sweet little party! I was really happy to be able to be with the kids for their birthday this year and especially happy for my sister.